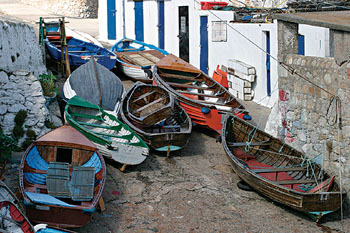 'Dalkey Dinghies': Photographer Tom Jacobs is one of this year's nearly 300 Open Studios participants. Clifford Hodges learned an important lesson from one of his friends a few years back: "Art is whatever an artist chooses to call attention to in the world." Whether it's the cubist portraits of Pablo Picasso, the nature-based conceptual works of Italian artist Giuseppe Penone or the video installations of Bill Viola, the scope of modern art has eclipsed all former definitions of art. Thankfully, obsequious portraits of minor nobility are no longer the zenith of creative expression. Always eager to meet and learn from other artists and craftspeople, Hodges decided to participate in this year's Santa Cruz Cultural Council's annual Open Studios event. To facilitate the shared expression of our unique creative skills, Open Studios heaves open the gates to nearly 300 artistic spaces around the county each fall. Over the course of three weekends, the first this year falling on Oct. 1, art patrons and appreciators alike can rove around the county, map in hand and eyes peeled for the distinctive green directional signs that indicate that an open studio is near at hand. On Escalona Street, they'll find Hodges' work, which is concerned with "learning more about how to live closer to the earth" by replicating some of the vanishing skills that Native Americans used for centuries before colonization and industrialization destroyed their way of life. Hodges has spent the last half decade learning the dying art of flint knapping, a reductive process in which he chisels knives and arrowheads out of obsidian blocks. Not that he can use his carefully crafted arrows to hunt, though. Federal law still prohibits the use of stone-pointed arrows to take down game. This archaic law was designed specifically to limit Native Americans' ability to lead self-sustaining lifestyles, but it's still not off the books. Hodge's interest in flint knapping and tool creation was born out of his love of the outdoors. After attending a Tracker School event in Boulder Creek, he was instantly hooked on creating tools that would allow him to survive in the wilderness, "whether I was forced to, or whether I choose to." But this young artist is no survivalist fanatic. After being raised in Santa Cruz, he traveled to Boston where he received both a bachelor's and a master's in electrical engineering from MIT. His academic training still influences his decidedly unplugged artistic process. Each time he brings his antler billet down into the obsidian block, his eyes are keenly attuned to "setting up angles and using the right kind of force to travel through the rock." Artists from nearly every medium and discipline are represented in this year's Open Studios. In the words of the Cultural Council's events manager, Ann Ostermann, so long as an artist's oeuvre "shows technical proficiency and a consistent voice and personal vision," they are "welcome to apply to be part of Open Studios." 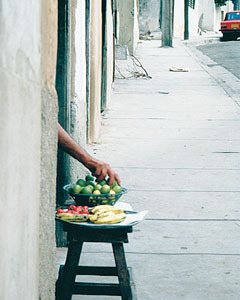 'Fruit Stand': Bill Clark's photograph shows how Cubans love to impersonate Addams Family characters. In a city with a legendary penchant for artistic expression, competition is fierce to get a slot in Open Studios. To counter the crush of applications, 13 rotating members of a selection committee (subject to term limits--unlike, say, Supreme Court justices) review the artistic offerings, which are submitted under a curtain of anonymity to prevent any form of cronyism. The selection process takes months to come up with the lineup of the next year's event. Each year brings new talent to the event, and this year, over 30 first-time artists are included. One of these "newcomers" has called Santa Cruz home since 1971. David Glenn has been creating painting in his upper West Side home for much of the last 30 years. Inspired by prayer mandalas and Native American iconography, his acrylic and model-airplane-paint creations are dense, closely controlled and deeply textured compositions. "When I look into it," Glenn says, reviewing one of his pieces, "it is not a flat thing. There are layers and patterns that give it depth." His pieces are a study in balance, though their creation was completely spontaneous. His extemporaneous methods are simple. "I put something down and then figure out how to resolve it." Glenn's work illustrates one of the most intriguing parts of Open Studios--visitors can see the process behind the creations of local artists. Whether it is meticulously chipping obsidian or laying out half-inch grids on Masonite to create a mandala, the process is as much a part of the ultimate creation as the finished project. Process also plays a key role in the creations of artist Liz Lyons Friedman. A participant in every Open Studios since the event's inception, Friedman's work combine printmaking and painting to create pieces that reflect the artist's personal experiences. She first prepares a linocut in much the same way that Gutenberg first cut out the frontispiece to his bible. After the print is made, she goes back and carefully layers watercolor into the negative spaces to build up the color and depth of her offerings. For Friedman, the opportunity to exhibit her work in her space that she shares with photographer John Gavrilis is only matched by her appreciation for those that actually make the artistic pilgrimage down to her Aptos studio. The "awareness and appreciation of the arts" that her visitors show as they walk through her succulent-sprinkled garden ends up being a "motivating influence" for her continued artistic endeavors. Over the course of the last 20 years the event has grown both in scope and in quality, but its mission has remained the same, to help expose artistic minds to local talent and also to better enable artists to reach a public that they so desperately need in order to economically survive on the Central Coast. The Open Studios event is such a success that the City of Brotherly Love, Philadelphia, has mirrored the Cultural Council's approach in setting up their own open art space tour. This big city endorsement only serves to reinforce the success story that Open Studios has become. Cultural Counsel executive director Dr. Alberto P. Ráfols is understandably proud of the work of the Council and its myriad volunteers. In his words, "We have a functional event that serves our artists and the patrons at the same time." But his true vision for the festival extends past the next three weeks: "Hopefully it will also inspire young people to be artists." Open Studios Art Tour happens Oct. 1-2 at studios south of Yacht Harbor, Oct. 8-9 at studios north of Yacht Harbor, with Encore Presentation of Selected Artists Oct. 15-16. Information and catalogs are available through the Santa Cruz Cultural Council at 831.475.9600 or www.ccscc.org. From the September 28-October 5, 2005 issue of Metro Santa Cruz.